No time is more appropriate than now to build the culture of peace. No social responsibility is greater nor task more significant than that of securing peace on our planet on a sustainable foundation. Today’s world with its complexities and challenges is becoming increasingly more interdependent and interconnected. The sheer magnitude of it requires all of us to work together. Recognition of the human right to peace by the international community, particularly the United Nations, will surely generate the inspiration in creating the much-needed culture of peace in each one of us. Nearly thirteen years ago in 1998, on the occasion of the 50th anniversary of the Universal Declaration on Human Rights, a group of civil society organizations launched a global campaign for the recognition by all of the human right to peace. They declared, “We are convinced that after this century with its horrible wars, barbarism and crimes against humanity and human rights, it is high time for the ‘Human Right to Peace’ “. They elaborated by underscoring that “the right to live is not applied in times of war – this contradiction and the undermining of the universality of human rights must be ended by the recognition of the human right to peace”. They called upon all “to prevent violence, intolerance and injustice in our countries and societies in order to overcome the cult of war and to build a Culture of Peace”. Both objectives still remain elusive, unattained – human right to peace has not yet been fully, formally and directly recognized as well as efforts needed for advancing the culture of peace remain sidelined in the UN system. The international community over the years has been endeavoring to establish the universality of peace and human rights. The United Nations, in its Charter, recognized peace as central to its existence and affirmed that it is both a prerequisite and a consequence of the full enjoyment of human rights by all. The collective dimension of the human right to peace was codified in the preamble to the Charter of the United Nations, as the responsibility to save succeeding generations from the scourge of war lies with the peoples. The collective right of peoples to peace and security was also proclaimed by Article 23.1 of the African Charter on Human and Peoples’ Rights of 1981. Also, in 1984, the UN General Assembly proclaimed that “the peoples of our planet have a sacred right to peace”; and declared that “the preservation of the right of peoples to peace and the promotion of its implementation constitute a fundamental obligation of each State”. 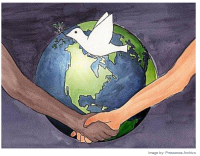 With regards to peace, the 1999 Conference of The Hague Appeal for Peace is worthy of mention, because it approved an ambitious political document entitled “Agenda for Peace and Justice for the 21st Century”. The Agenda comprised four main appeals on disarmament and human security; prevention, resolution and transformation of violent conflicts; international humanitarian and human rights law and institutions; and the root causes of war/the culture of peace. Since then civil society has assumed that peace, justice, development, disarmament and the respect for human rights are essential elements to build the culture of peace to challenge our current culture of violence. Pioneering steps in this context were taken with the Istanbul Declaration, adopted in 1969 by the XXI International Red Cross Conference, which states that human beings have the right to enjoy lasting peace as well as with the United Nations Commission on Human Rights resolution in 1976, which affirms that everyone has the right to live in conditions of peace and international security. I am very proud to say that the civil society organizations have been the most forward-looking advocating for the recognition of human right to peace. The leadership role in this campaign has been played by the Spanish Society for International Human Rights Law (SSIHRL). They adopted a landmark document in October 2006 titled the “Luarca Declaration on the Human Right to Peace” that articulates a very forceful and comprehensive expose of the subject and hopes that it would be considered by the United Nations General Assembly “in the near future.” Five years have passed in between. A very valuable aspect of the Luarca Declaration is that it crafts all the various “elements of human right to peace” bringing together, in an effective manner, the universality, interdependence and indivisibility of human rights and the overriding need to achieve international social justice. It also affirmed very boldly and rightly that the effectiveness of the right to peace will not be achieved without the realisation of equal rights for men and women. The recognition of “enabling” human rights, such as peace and development, is required to achieve a coordinated response on a worldwide scale to those threats to human rights arising from the global interdependence of all peoples and nations. Indeed, the prevailing condition of extreme poverty, hunger and disease in the world mean not only a clear violation of fundamental human rights, but also a real threat to millions of human beings. The Luarca Declaration was further elaborated in the Bilbao Declaration that was subsequently reviewed by the International Drafting Committee – ten experts from five regions of the world – meeting in Barcelona which adopted on 2 June 2010 the Barcelona Declaration on the Human Right to Peace, thus providing international acknowledgment to the private codification process initiated in Luarca in 2006. I had the honor and pleasure of being the Chairman of that International Committee. The Barcelona Declaration got endorsed by the broad-based International Congress held in Santiago de Compostela in Spain. Since 2007 the Human Rights Council is reaffirming the fundamental value of solidarity in global relations. The Millennium Declaration adopted by the United Nations in 2000 affirmed that “global challenges must be managed in a way that distributes costs and burdens fairly, in accordance with basic principles of equity and social justice, and that those who suffer, or who benefit least, deserve help from those who benefit most”. In the international community, there was also increasing recognition of what is being called ad the third generation of human rights closely linked to the fundamental value of solidarity – first generation being political and civil rights and the second being the economic, social and cultural rights. Nearly 1800 civil society organizations joined together to form in Geneva an alliance in support of the recognition of the human right to peace by the Council and ultimately by the UN General assembly. Addressing the arguments raised by the detractors of the proposal in relation to the allegedly vague content of the human right to peace, Canadian peace exponent Douglas Roche underscores that the human right to peace “is the product of a paradigm shift at the international level. Rights that focus solely on the relationship between the State and the individual are not sufficient in responding to a globalized world in which problems are no longer defined purely in national terms. The same global circuitry that fuels transportation, information, finance and organization has also increased the power of the arms trader, the warlord, the religious fanatic, the deranged political leader, the human trafficker and the terrorist. There is, thus, a technological burden with which the other two generations of human rights were never designed to cope, and the human right to peace is an attempt to respond to the perils of the modern interconnected world. Dismissing the human right to peace as vague and declaring that it offers nothing new is an exercise that misses the mark. The human right to peace is innovative and addresses a whole swathe of new and interconnected global challenges”. Although international law and politics acknowledge the prevailing interrelationship between human rights and peace, the recognition of the right to peace as an autonomous human right has not yet been achieved by the UN General Assembly. Nevertheless, I and like me many believe that the right to peace should be qualified as a right of solidarity. The international solidarity requires international cooperation, union of interest and joint action in order to preserve not only the fabric and very survival of international society, but also to achieve the collective goals. All means used to achieve this global purpose are shared by the right to peace, because the “cooperation for the maintenance of international peace and security is an absolute necessity for the implementation of this right”. Once the right to peace is established as a new human right, it would provide a solid basis to the culture of peace. Its recognition would also give fresh impetus to the struggle against violence and attitudes based on force, imposition and gender discrimination. Recalling Einstein’s comment that “Peace cannot be kept by force … it can only be achieved by understanding”, my dear friend and colleague Federico Mayor, who has been a visionary leader of UNESCO, said, “we must understand today that if peace is the right of all people, then a culture of peace is the responsibility of all people”. So profound and so appropriate!! Promotion of peace needs to be understood not only in the passive sense of the absence of war, but also in the positive sense of creation of conditions of equity, gender and racial equality and social justice. Indeed, depriving people of their economic, social and cultural rights generates social injustice, marginalization and unrestrained exploitation. It follows that there exists a correlation between socio-economic inequalities and violence. Thus, the realization of the right to development is vital to reduce any kind of internal or external violence within society. It is therefore necessary to reincorporate into the international agenda the issue of the right to peace, which had disappeared since the end of the Cold War. The United Nations should re-engage in the real sense in favour of solidarity, human rights, international cooperation, disarmament and peace as a whole. With that objective, a landmark decision was taken by the United Nations to adopt the Declaration and Programme of Action on a Culture of Peace in 1999. I had the honor of chairing the nine-month long negotiations for reaching consensus on this norm-setting document. Peace is a prerequisite for human development. And peace cannot be achieved unless the mind is at peace. Peace is meaningful only when we have peace within and peace outside. We should never forget the profound words incorporated in the UNESCO Constitution that “Since wars begin in the minds of men, it is in the minds of men that the defenses of peace must be constructed.” The flourishing of culture of peace will generate the mindset that is a prerequisite for the transition from force to reason, from conflict and violence to dialogue and peace. No time is more appropriate than now to build the culture of peace. No social responsibility is greater nor task more significant than that of securing peace on our planet on a sustainable foundation. Today’s world with its complexities and challenges is becoming increasingly more interdependent and interconnected. The sheer magnitude of these requires all of us to work together. Global efforts towards peace and reconciliation can only succeed with a collective approach built on trust, dialogue and collaboration. For that, we have to build a grand alliance for the culture of peace amongst all, particularly with the proactive involvement and participation of the communities. In today’s world, more so, the culture of peace should be seen as the essence of a new humanity, a new global civilization based on inner oneness and outer diversity. Seed of peace exists in all of us. It must be nurtured, cared for and promoted by us all to flourish. Peace cannot be imposed from outside; it must be realized from within. A key ingredient in building the culture of peace is education. Peace education needs to be accepted in all parts of the world, in all societies and countries as an essential element in creating culture of peace. The young of today deserves a radically different education – “one that does not glorify war but educates for peace, non-violence and global cooperation.” They need the skills and knowledge to create and nurture peace for their individual selves as well as for the world they belong to. All educational institutions need to offer opportunities that prepare the students to be responsible and productive citizens of the world and should introduce the teaching that builds the culture of peace. We should not also be oblivious that non-violence can truly flourish when the world is free of poverty, hunger, discrimination, exclusion, intolerance and hatred – and when women and men can realize their highest potential and live a secure and fulfilling life. Here let me underline a point very strongly that much of the dynamic progress towards culture of peace derives inspiration and hope from visions and actions of women who constitute half of the world population. Promotion of equality between women and men and equal participation of women in all decision-making are essential prerequisites to attaining sustainable peace. As has been said, “For generations, women have served as peace educators, both in their families and in their societies. They have proved instrumental in building bridges rather than walls.” I believe with all my conviction that when women are marginalized and their equality is not established in all spheres of human activity, neither the human right to peace is worthwhile, nor the culture of peace is possible. Ambassador Anwarul K. Chowdhury is former Under-Secretary-General and High Representative of the United Nations and at present, the Senior Special Advisor to the President of the UN General Assembly. This Viewpoint is adapted from the speech Ambassador Chowdhury made on 25 September 2011 at the Platform Meeting at the New York Society for Ethical Culture.